Iron Man 3 provides our first look at ‘Phase Two’ of Marvel’s Avengers plan – that is, the movies that come between The Avengers and its sequel – and our first insight into how that process is going to work. For starters, there is continuity from the events of The Avengers into this next Tony Stark adventure. However, these events have resulted in a logical shift within realism of the ‘Iron Man universe.’ For the first two films in the trilogy, Stark existed in a world that was more or less realistic. Our heroes and villains may have been ultra-rich and incredibly smart, but they were always basically human beings transformed into superheroes and villains through the use of technology. But The Avengers broke this realism by introducing aliens and gods, alternate dimensions and portals. Iron Man 3 acknowledges this shift in reality, giving a prominent narrative place to Tony Stark and other characters coming to terms with what they experienced in New York (“In New York” becomes code for the things that happened in The Avengers). Stark himself is traumatised by the events to the point that he suffers from anxiety attacks. This shift in reality also allows for a scaling up of the threat in Iron Man 3. Our villain this time is the mysterious terrorist, the Mandarin, played menacingly by Ben Kingsley with a voice that is some combination of Richard Nixon and Heath Ledger’s Joker. The Mandarin is resourced by jaded scientist Aldrich Killian, continuing the tradition from the first two films of it being a battle of the brains. However rather than resourcing him with weapons or super-suits, Killian resources him with an army of genetically modified super soldiers. Therein lays the break in realism which would not have been acceptable without The Avengers. Of course, not all our questions are answered. The primary one being, when the world comes under threat again, why does Tony Stark have to face this particular challenge on his own? At what point does a catastrophe become significant enough to warrant getting the band back together? For this third instalment in the Iron Man trilogy, Jon Favreau has handed over directorial duties to Shane Black. Black’s only previous directorial experience was 2005’s Kiss Kiss Bang Bang, a brilliant if under-appreciated film which represented a very important step the comeback of Robert Downey Jr. which ultimately culminated in Iron Man. Black had made his name as a screenwriter of action-comedies, most notably the Lethal Weapon series, making him a pretty good fit for Iron Man 3. And Black does what he does best in this film, ramping up the laughs and the sense of fun in the film without undermining its drama and tension. Black taking over as director has also enabled Jon Favreau’s character, Stark’s body guard Happy Hogan, to take on a much larger role than he did in the first two films. For a film about a superhero who wears a mechanical suit, Drew Pearce and Shane Black’s screenplay surprisingly sees Tony Stark spending the vast majority of the film, including a number of the action sequences, not suited up. That they felt the freedom to do this is indicative of the fact that over the span of this franchise the writers have successfully achieved what all superhero scribes wish for; they have got the audience invested in Tony Stark as a person, not just as Iron Man. When Christopher Nolan and David Goyer set about writing Batman Begins, one of their primary goals was to get the audience to care about Bruce Wayne as a person so that they weren’t just killing time until he put on the suit. In the case of the Iron Man franchise, you could almost go so far as to argue that audiences have a greater investment in the character of Tony Stark, and the charisma of Robert Downey Jr.’s portrayal of him, than they do in the figure of Iron Man. Downey Jr. as Tony Stark is the trump card this franchise has to play, so it makes sense that Black set out to give him as much screen time as possible. This is further assisted from within the unfolding narrative of the series, with the constant evolution of the suit now seeing it as a piecemeal set of armour, which enables him to have any combination of his arms, legs and torso suited up without necessarily having to have his face covered. 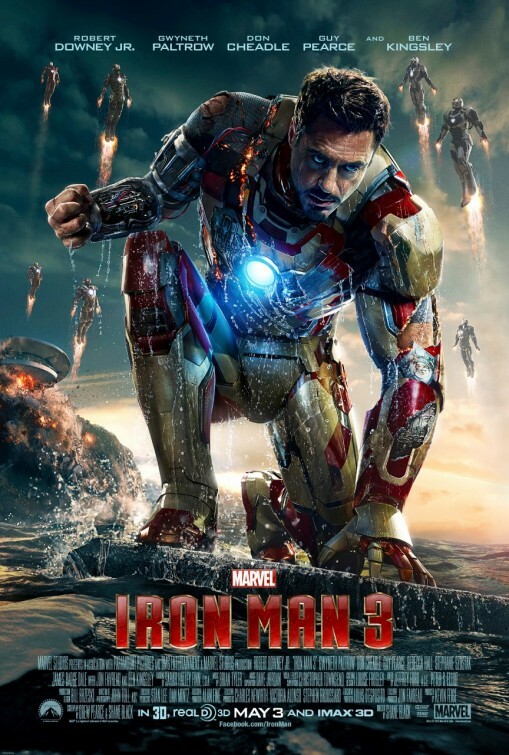 Amazingly, Iron Man 3 represents Downey Jr.’s fifth appearance as Tony Stark – the Iron Man trilogy, The Avengers and a brief cameo The Incredible Hulk. This is staggering considering that the first Iron Man film was only released in 2008. It took Bruce Willis 25 years to appear five times as John McClane. Stark is now without a doubt the role with which Robert Downey Jr. will be forever associated. The way in which he has brought this character to life could also be arguably his greatest acting achievement, although he is excellent in Chaplin. It does not necessarily go hand in hand that the role for which an actor is remembered is also their best work, so he is quite fortunate there. Iron Man 3 also contains a very brave plot twist, which I’ve been careful not to give away here. Brave in the sense that it is in equal parts fantastic and disappointing, and has thus far left audiences very divided. Where Iron Man goes from here is anyone’s guess. We know there is going to be a sequel to The Avengers, there is no way that Marvel will let that not happen, and Iron Man 3 finishes with a Bond-esque “Tony Stark Will Return,” but it also has a sense of wrapping up which makes gives the impression that this may be the last solo Iron Man adventure. If that ends up being the case, Iron Man 3 is a fitting completion to a rollickingly fun trilogy.